Laundry is like a monster that takes over the world. Wherever you turn, there is always another pile of stinky socks waiting to be washed or overflowing baskets of laundry that need to be folded. It is something that you just can’t escape: Laundry is the job that never goes away. If you are a stay-at-home mother, the laundry can seem to overshadow your most important job: being a mom! Let’s explore some interesting ideas about how to manage family laundry. You won’t get any help with ways to manage laundry from your infants. They are much too busy dirtying laundry to participate in family laundry solutions. The good news is that toddlers can and should be taught to help. Achieving a task that makes Mommy proud boosts a child’s self esteem. Use laundry as a teachable moment. Sorting piles by color and matching up socks can be accomplished by your little ones with just a little help from Mom. Before you know it, they may not even need your help. All kids stain their clothes, and if we are being honest, so do most adults. One of the best family laundry tips ever is to use a stain remover on all stains as soon as possible. Kids can help with this, too. Teach them to separate the clothes that need stain treatment from the rest of their laundry. The older kids can even spray on the stain remover before the clothes go in the hamper. It will save you a step and teach the kids a valuable lesson. Nowadays, doing laundry is far different from the job your grandmother did. The materials our clothes are made from have changed. Advances have been made in cleaning products, and technological advances have changed the washing machine as well. If you asked your grandma how to manage family laundry, you would see just how much has changed. Embrace the change. Products like SockSync could make your laundry day easier, quicker, and a little bit more enjoyable. SockSync is a revolutionary new product that makes finding and folding your socks faster and less of a hassle. It works by putting your unmatched socks right in front of you and then you match them up and push it through the sock holster into the basket. It couldn’t be easier! 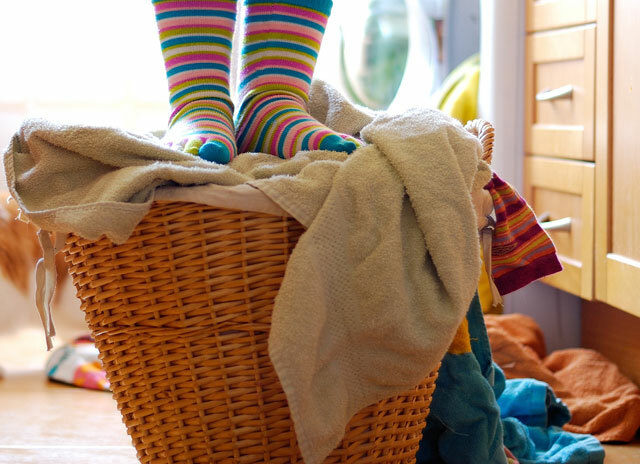 Stay-at-home moms may find that setting a laundry schedule helps them get everything done. Maybe your family laundry solutions will include starting the laundry first thing in the morning or putting a load in the washer at bedtime. If you wash it at night, you can pop it in the dryer early in the morning. This may help you get a tedious task out of the way so you can move on to more fun adventures. No, the hiding spot is not for you. Don’t be afraid to have a room with a door that can stay closed when company is over. You can stick the laundry in there, along with anything else you don’t have time to clean and put away. Your friends and family will be dying to hear your tips on how to manage family laundry and keep your house clean with little ones underfoot. Raising a family is the most important job you will ever have. Family laundry tips will help to ease the burden of chores that need to be completed. Just don’t let yourself get bogged down by everyone’s advice on ways to manage laundry or other household chores. Enjoy your children, and teach them the importance of accomplishing even the smallest chores. Practice a little time management, and don’t stress over the schedule you couldn’t keep or the laundry that didn’t get folded.